DEMERIT (AUS) (Brown 2006-Stud 2011). 2 wins at 1200m, 1400m, MRC Caulfield Guineas Prelude, Gr.3. Half-brother to SP Evander. Sire of 57 rnrs, 24 wnrs, inc. SP Spangled Impact and of Minus Looks, Puteri Jewel, If Only, Anisau, Bergio, Detango, Hey Listen, Juendis, Recoiled, Diraja Jewel, Miss Somebody, Penalty Point, Skylar Storm, Venus Ebony, Double Digit, Smallamountofmerit, Captivated Point, Dante's Destiny, Don't Speed, Gordon's Cungee, etc. London Court (g. by Fimiston). 9 wins from 1200m to 1600m, A$135,500, WATC Amelia Park Beef H., Private Steer H., 2d WATC Turn a Glow H., Caliway H., 3d WATC Budget Truck Rental H., Fishers Circle H., Grey Sapphire H., Kalgoorlie/Boulder Reunion H.
I'm Here to Win (f. by Numerous Times). 8 wins to 1400m, A$216,295, WATC Westspeed 3YO H., Player H., Pink's Floor Care H., Join the TAB Party H., 2d WATC Air & Water Residential H., Westspeed 3YO H.
If Only (g. by Demerit). Winner at 2 in 2015-16, WATC Amelia Park 2YO P.
Radio Pleasure (g. by Stay Tuned). 8 wins from 1200m to 1850m in Aust. Captivated Point (g. by Demerit). Winner. See below. And So Am I (g. by Bearcat). Placed to 2016-17 in Aust. Tribal Cat (f. by Bearcat). Placed in Aust. Lots Happening (g. by Stay Tuned). Placed in Aust. Not So Vain. 7 wins from 1300m to 1600m, A$96,033 in Aust. Zanegrey. 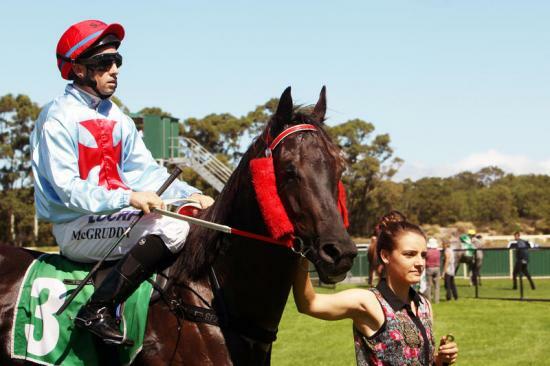 2 wins at 1400m in Aust. KERRIFIC (Blackfriars). 13 wins from 1100m to 1600m, A$612,800, WATC Belmont Sprint H., Gr.3, RJ Peters S., Gr.3, Grandstand Cup, L, Italian Festival 2011 H., Bonaire H., Playeronline.com.au H., Perth Racing on Facebook H., Ascot Corporate Villas H., Perth Racing Christmas in July H., Eddie Cant H., 2d WATC Hyperion S., Gr.3, Northerly S., L, Pinjarra Classic, L, WATC Kalgoorlie City Football Club H., Perth Ice Party Ice H., 3d WATC Asian Beau S., Gr.3, Cyril Flower S., L, Detonator S., L, River Mist H., Racingjobs.com.au H., 4th WATC Railway S., Gr.1, RJ Peters S., Gr.3, Birthday S., L.
Al Faisal. 5 wins to 1200m to 2015-16 in Aust. De Mews. 4 wins at 1000m, 1100m, 3d WATC Westspeed Nursery H.
Scandalous Lady. 3 wins at 1300m, 1400m to 2015-16 in Aust. Emerald Star. Winner at 1200m in Aust. She's Delicious. Winner at 1200m in 2015-16 in Aust. Handsome Zac. Winner at 1300m in Aust. Pink Slipper. Winner. See above. Beautiful Conquest (Indian Conquest). 7 wins. See above. Race Record: 5 Starts 1-0-0 A$13,550. Winner at 1050m in 2015-16 in Aust.